There is a growing crisis in our oceans as rates of infectious disease outbreaks are on the rise. Marine epidemics have the potential to cause a mass die-off of wildlife from the bottom to the top of the food chain, impacting the health of ocean ecosystems as well as lives on land. Fueled by sewage dumping, unregulated aquaculture, and drifting plastic in warming seas, ocean outbreaks are sentinels of impending global environmental disaster. 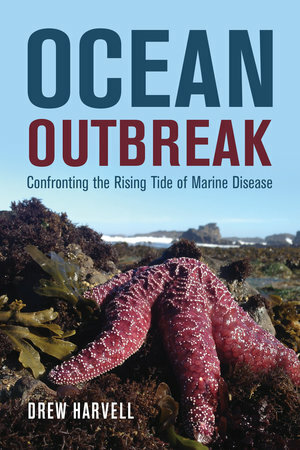 Ocean Outbreak follows renowned scientist Drew Harvell and her colleagues as they investigate how four iconic marine animals—corals, abalone, salmon, and starfish—have been devastated by disease. Based on over twenty years of research, this firsthand account of the sometimes creeping, sometimes exploding impact of disease on our ocean’s biodiversity ends with a hopeful message. Through policy changes and the implementation of innovative solutions from nature, we can reduce major outbreaks, save some ocean ecosystems, and protect our fragile environment. Drew Harvell is Professor of Marine Ecology at Cornell University. She has published over 170 scientific articles in leading journals and is a fellow of the Ecological Society of America and the Atkinson Center for a Sustainable Future. Her book A Sea of Glass received a National Outdoor Book Award and was recognized as one of the Smithsonian's Best “Art Meets Science” Books of 2016.